Regular followers of this blog have heard a bit of this before, but it’s worth repeating that China is a fantastic bargain, especially outside of the summer season. Unless you do the research yourself over the period of a whole year you might not realize that flights to China from the United States are much more expensive in summer, and the hotels and tours and so forth once you are there are also far more expensive. At the moment you can get a flight from New York to Beijing for only US$690 round-trip, and to Shanghai for only $740. From Los Angeles the prices are actually slightly higher, in spite of the shorter distance, so these sale fares seem to favor those on the east coast, weirdly enough. Another thing that you should know about Beijing and Shanghai during the summer is that both of them tend to be incredibly hot and the air quality is often horrible. When we see video clips of people climbing the Great Wall we don’t assume that it’s 100F and the person is weezing in the smog, but during summer that’s what you can expect. Winters in those Chinese towns do tend to get quite cold, but the hotels are all extremely modern and properly heated so as long as you wear a jacket then you’ll be fine. The best time to go is March or April, and the current fare sales go into those months, so this is a perfect time to be shopping for airfare to China. An organized tour or on your own? Most people, it seems, visit China as part of a large group tour, and prices for those tours are very low for what you get, but obviously not everyone wants to be with the same 43 other people for 9 straight days. 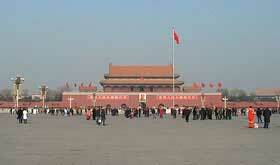 It is possible to travel independently in China as long as you obtain a visa in advance to do so. Once you get to China you can book train tickets or bus tickets or flights between all the major cities, and then sign up for tours of the famous sights just for the day. For example, you can take a train from Beijing to Xi’an and get a hotel there yourself for probably $20 a night. Then when you want to see the Terracotta Warriors you just ask at your hotel desk and they will book you on a tour of the site for the following day, at a very low cost. That way you can see China at your own pace and shop or dine wherever and whenever you want. Those big group tours are cheap partly because the group members have most of their meals together. This means you’ll be shuffled into large restaurants that can sit 44 people all at the same time, and that you’ll basically be getting buffet food whether you serve yourself or order it off a menu. Most of China’s best restaurants don’t serve in this style, so going on your own is worth more just for that alone.